A B-type bus operating on route 9 passing a regiment of cavalry. Copyright TfL. 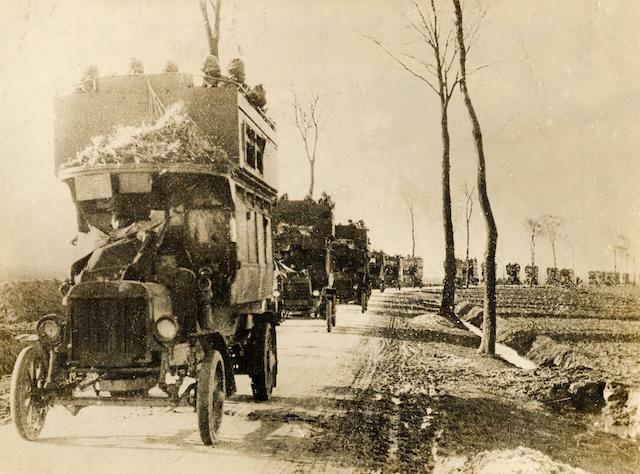 A procession of B-Type LGOC motor buses transporting troops during the First World War. Copyright TfL. 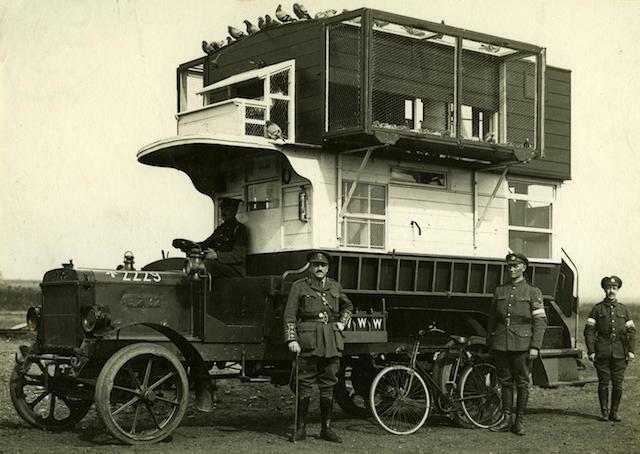 B-type bus (B2132) converted into a pigeon loft (for carrier pigeons) during the First World War. 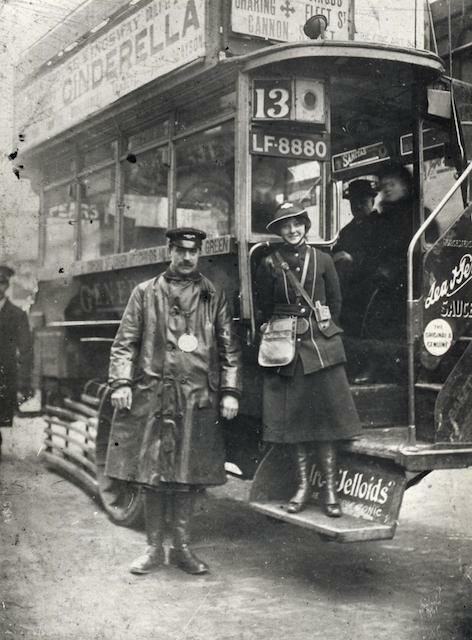 A driver and female conductor photographed during the First World War. Copyright TfL. Tributes to those who fought in the First World War are everywhere in the city; Whitehall proudly displays the Cenotaph and a memorial devoted to the contribution of women at war, while a Park Lane sculpture remembers the animals of war. 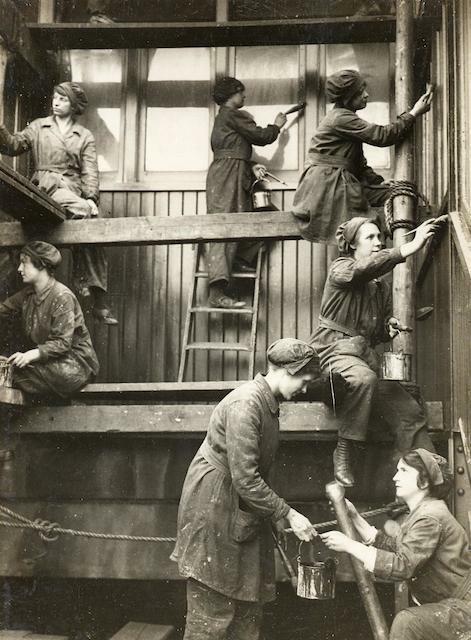 But London Transport and its workers had a significant role to play too, both on the home front and at the frontline. 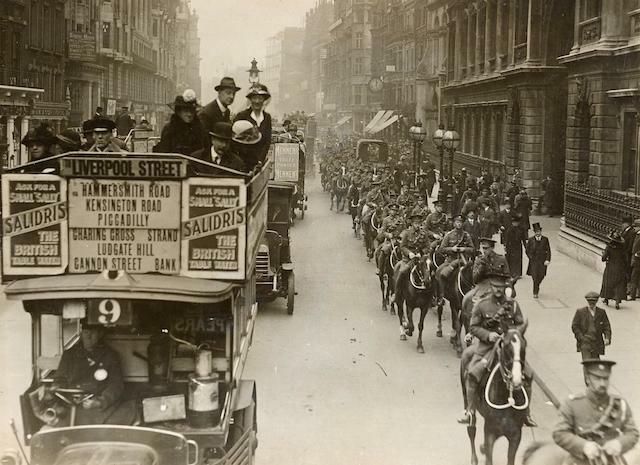 Forthcoming exhibition, Goodbye Piccadilly – from Home Front to Western Front explores the war from the unique perspective of London Transport Museum. It tells the story of the drivers who diverted their buses to the front line, and how conflict and aerial bombardment affected the daily lives of Londoners. A key theme is how war accelerated social change, particularly for women who, in the absence of men, took up employment as bus conductors, Underground porters and mechanics. From tube station air-raid shelters to inspiration for art and design, the First World War had a huge impact on London. LATE: To mark the opening, you can be among the first people to see the exhibition during a special Friday Late on 16 May. It will run from 6.45pm until 10pm with live music, silent cinema, bar, talks, including a perfumery talk with Sarah McCartney of '4160 Tuesdays'. Other activities include Edwardian men’s grooming sessions, a 1914-style quiz and the opportunity to make your own feathered fascinator. 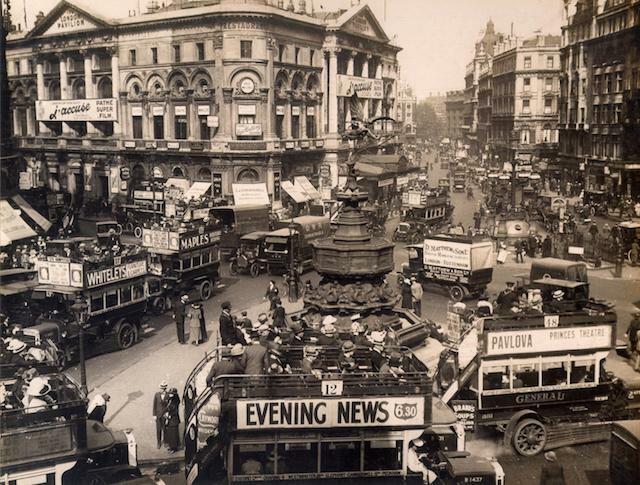 1911 BUS: Taking place within the Year of the Bus, it's fitting that the exhibition follows the route of the buses that bade farewell to the stops of Leicester Square to play an integral part in the war. Over 1,000 London General Omnibus Company vehicles were used to transport troops and equipment, as ambulances, and even as mobile carrier-pigeon lofts in Britain, France, Belgium and as far afield as Egypt. The star of the show will be ‘Ole’ Bill’, a 1911 B-type bus from the Imperial War Museum, which was refurbished as a permanent memorial to the role played by London buses in the First World War. BATTLE BUS: The Museum also plans to take one of the last surviving B-type buses that served in the war back to France and Belgium. A crowdfunding project has been launched to help restore the vehicle and dress it in wartime livery ready for a poignant visit to the former battlefields of the Western Front. The public will be able to see the 'Battle Bus' at various London events throughout the year, including The Lord Mayor’s Show and the Remembrance Day parade. 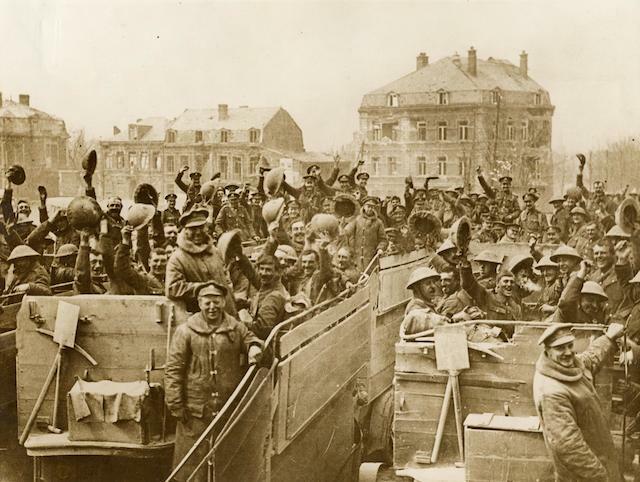 Find out how you can help get the Battle Bus back to the Western Front here. It will also take a broader look at the impact of aerial bombing on life in the Capital, including rationing and the important part the tube played in providing shelter. TALKS: Other events running to coincide with the exhibition include a talk about propaganda posters, Kate Adie on the ways in which the war changed life for women, and an open weekend at Acton bus depot starring 'Ole' Bill'. 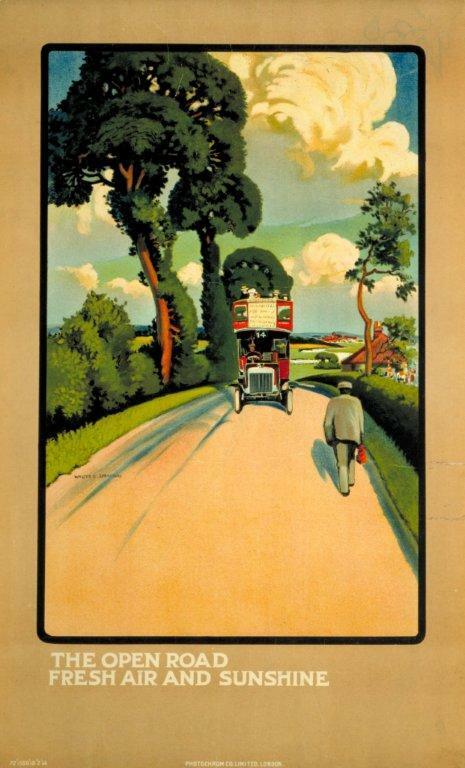 See the full schedule of London Transport Museum events here. 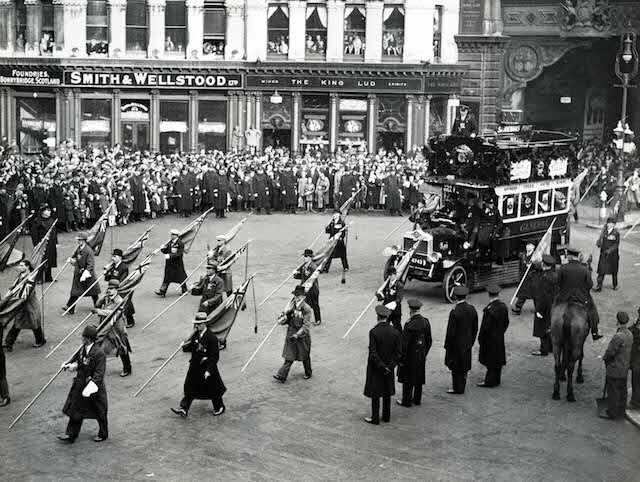 In the Year of the Bus and the centenary of the Great War, Goodbye Piccadilly is a good excuse to celebrate London’s iconic transport veterans, bussing Londoners around since 1829 — home would certainly be a long way to go without them. Goodbye Piccadilly opens at London Transport Museum on Friday 16 May and runs until 8 March 2015. Tickets for the Late on 16 May cost £10/£8 concessions and are available here.